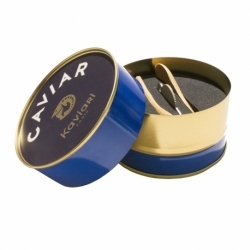 The Ossetra Caviar is made of russian Acipenser Gueldenstaedti sturgeon roes. Roes : regular-sized with a beautiful amber color. Taste : subtle aroma of the sea and a long, delicate hazelnut flavor. Want to learn more about caviar? Discover our Caviar Guide and impress your guests with your Caviar knowledge!